As many of you know, I recently released a children's book series written with my mom that I’m so excited is finally on shelves: Ask Emma (Bonnier Publishing). The plot is centered around 13-year-old middle-school advice blogger Emma Woods (I think of her as a cross between Emma Woodhouse from Emma and Cher from Clueless) who finds herself facing online bullies. The cyberbullying theme stems from my own experience at age12 (you can read my personal story here), where I was exposed to insults and verbal attacks similar to what the main character confronts. I made the decision to raise awareness for cyberbullying not only by writing how Emma rises above her situation, but also by aligning with No Bully. No Bully is a non-profit organization that works in schools to eradicate bullying by encouraging students to practice empathy and compassion towards each other. This past weekend, Bonnier Publishing and No Bully teamed up with us for an amazing book launch party at NYC’s Lord & Taylor Department Store. Check out some of the deets below. Upon entering the beautiful venue (Sarabeth’s Restaurant at Lord and Taylor’s), guests were greeted by giant book covers hung around the room, as well as huge black and white sketches of Emma herself by illustrator Laura Hole. There was a table in the corner stacked to the ceiling with books, and we allocated all of the night’s proceeds from the purchases of personalized, signed copies to No Bully. After giving my speech, where I shared my cyberbullying experience with everyone, people seemed very moved and inspired. By the end of the party, we raised $1,234! There was a camaraderie among the 70+ guests, even though many people were just meeting for the first time. Attendees enjoyed sampling Sarabeth’s signature hors d'oeuvres: “pigs in a blanket,” mini pesto pizzettes, bite-size turkey club sandwiches, and watermelon feta skewers. As for the desserts, besides Sarabeth’s delicious signature currant scones topped with clotted cream and preserves, Georgetown Cupcake’s red velvet, lava fudge, and vanilla cupcakes adorned with mini fondant “Ask Emma” book covers stole the show. I have been hiring the bakery to cater important events for years--it wouldn't be a party without their delicious treats! As the night drew to a close, attendees grabbed adorable goody bags filled with all the “write stuff:” mini journals, stunning “diamond” pens from Townley Girl, and Lindt emoji chocolates, since you can never have too much sugar. I am incredibly proud of Ask Emma, not just because I have been working so hard on the book for the past year, but because readers can finally get to know Emma like I have. It might sounds strange, but I feel like Emma has become one of my best friends. Writing Emma’s experience helped me figure out how to cope and move past my own cyberbullying situation. Now I can only hope that she does the same for you. 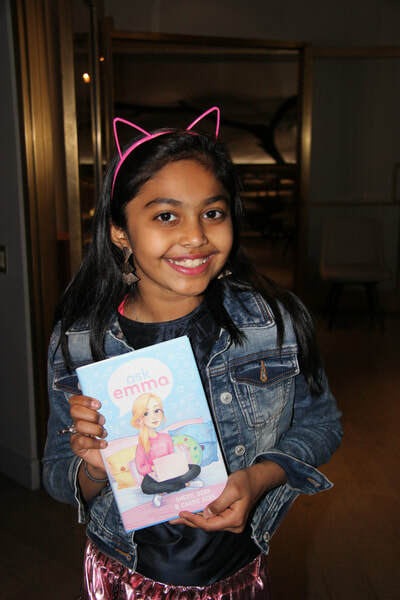 You can purchase Ask Emma on Amazon (using this link: https://www.amazon.com/Ask-Emma-Book/dp/1499806477) , at Barnes & Noble, or at a bookstore near you.